Fire Station 10 Center Plaza, Chinatown-International District, Seattle, WA. The artwork was developed after extensive interviews with Seattle’s Asian community. Bornstein’s guide was activist Donnie Chu who told her that firefighters of Seattle's oldest station have a historic relationship with the community that goes back 100 years. At that time, the city had laws prohibiting firefighters from putting out fires in Chinatown. When large buildings were condemned, the firefighters helped change the laws and arranged for neighborhood residents to work round the clock to meet deadlines and bring buildings to code. Inspired by forms found in Asian art, architecture, folk-craft and public safety gear, the multi-sculptural environment represents the guardians of the city. Just as the staff of the station in the Chinatown-International District is responsible for the public safety of the city, the surrounding Asian community stands watch over the interests of their neighborhood. 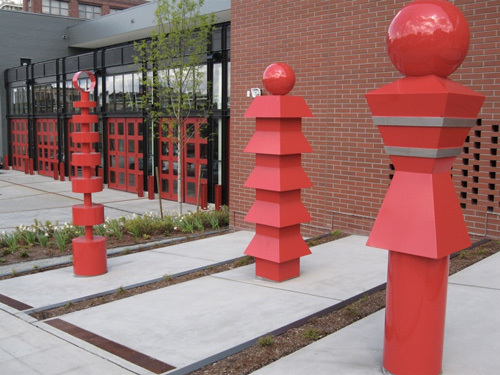 The artwork explores shifting perspectives through the placement of eight sculptures, diminishing in size along the upgrade of the Fire Station 10 sidewalk. In 2004, artist Gloria Bornstein began working on a design team with Weinstein Architects + Urban Design and Gustafson Guthrie Nichol (Landscape architecture), the designers of the Fire Station 10 Replacement Project. Bornstein, commissioned by the Office of Arts & Culture, developed an art plan, as well as a proposal to create an artwork, for the new facility. In her art plan, she made recommendations for locations for her artwork and artworks by other artists.